whose life is a circus. Being youngest is just not fair. And the way this is developing as a series of interrelated characters is fascinating. Are you imagining these relationships, or did you learn about them? To me, it looks like the last two photos for Izzy and Henry were taken in approximately the same location. By the way, do you know where? It looks like somewhere in the High Plains, but I'm not sure. All of these poems, including the relationships...completely fictional. That I am making people believe I'm writing down stories I already knew is some kind of compliment! You all are believing my fiction!! Mom had no idea who "Lizzy" was, or where that was taken. "Jack" is likely one of my dad's cousins, but no one I actually knew in person. This photo (and others that have this same dry, flat, empty look) were likely taken at "The Home Place" where my dad grew up, north of Burlington. Here's mine for the day over at the new poem place blog. It's about the common work of common folks, and some uncommon lemon cake. that's a story all by itself, Mary Lee. It's really fun watching this story unfold. You totally had me fooled- I was sure you knew all of these people, knew their stories, and were just capturing it for us. I can't wait to see where your story goes. A novel in verse in the making??? What a poignant poem, Carol. I suspect that Mary Lee's right about the killing. Many kids in my class at school have gutted a deer or some other animal already in their short lives. Still, though, my college roommate's grandfather was a vegetarian when I met him in 1985. 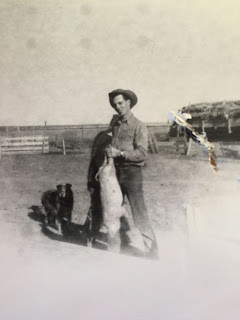 Had been one for 70+ years since he found out at a tender young age that the pork they were having for dinner was, only that morning, the runt of the litter he had care for. His parents couldn't understand the sentiment, but he couldn't eat meat since that time, which was quite a feat in rural Minnesota. I am with your friend's grandfather. I do eat meat. At the same time, the meat that I buy in the grocery store feels super different than this meat he is holding in his hands. I am a city girl and don't know much about pigs. I wonder how long they typically live before they kill them for meat. The stuff I read said only six months for bacon, etc, otherwise it gets too fatty. That grossed me out a little, ok, a lot! And there is always the Charlotte's Web thing going in the back of my head. I love the fiction of these. You're onto something.